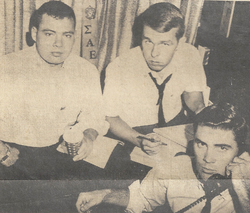 In 1965 the Brother responsible for this whole thing was Jim Keithly '66. 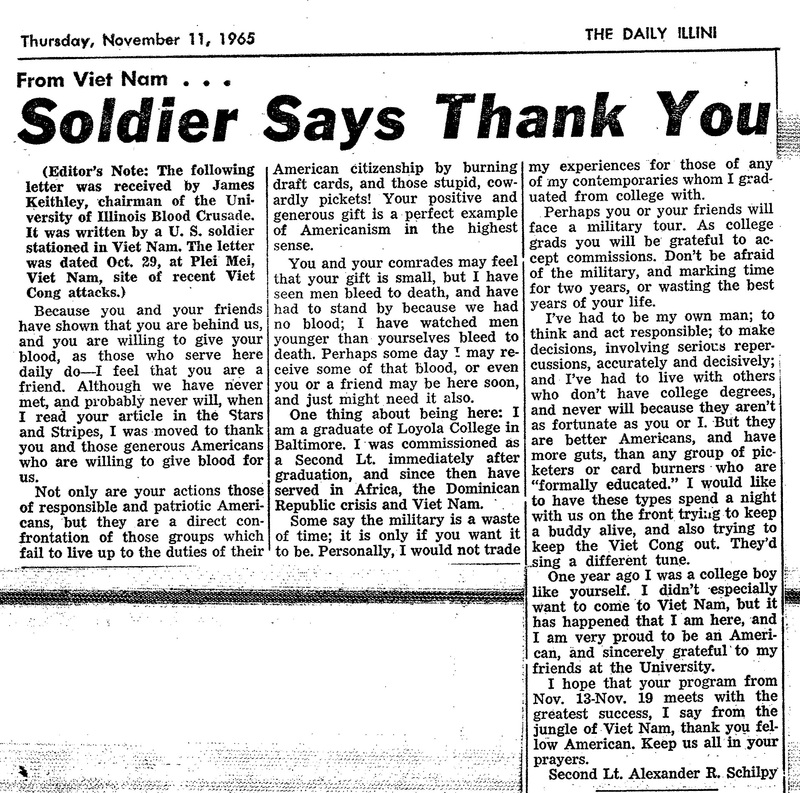 His father was serving in Viet Nam. 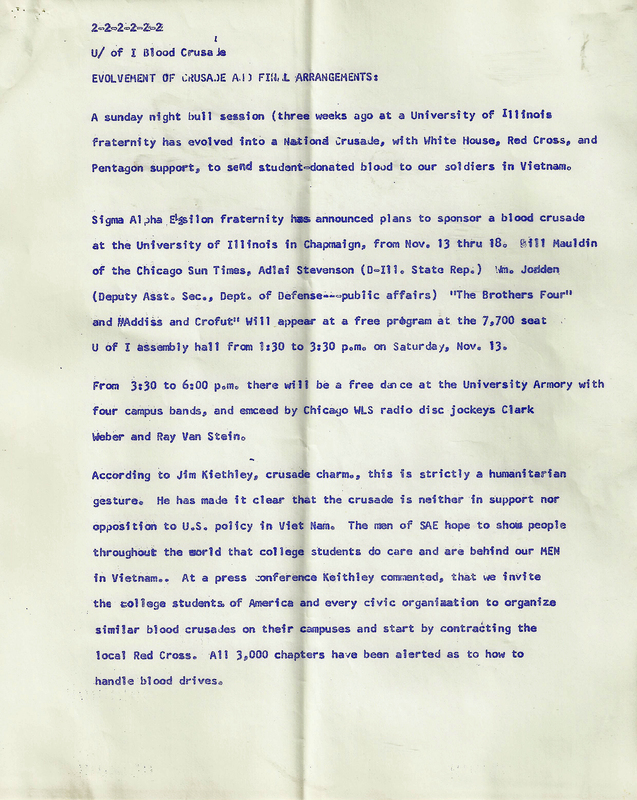 He started the ball rolling for the campus wide blood drive during an early fall Saturdat evening bull session at the SAE Illinois Beta Chapter House when he let a group of the Brothers know that his father told him that the troops fighting with him there appreciated knowing they had support back home. 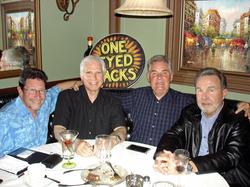 THE ENTIRE CHAPTER BECAME INVOLVED AS WELL AS LOCAL ALUMNI. Phil Hinderberger '65, Budd Carr '67, George Harvey '67, John O'Hare '68, Rick Kummer '68 and Alan Krejci '68 were some of the active participants in the campaign. 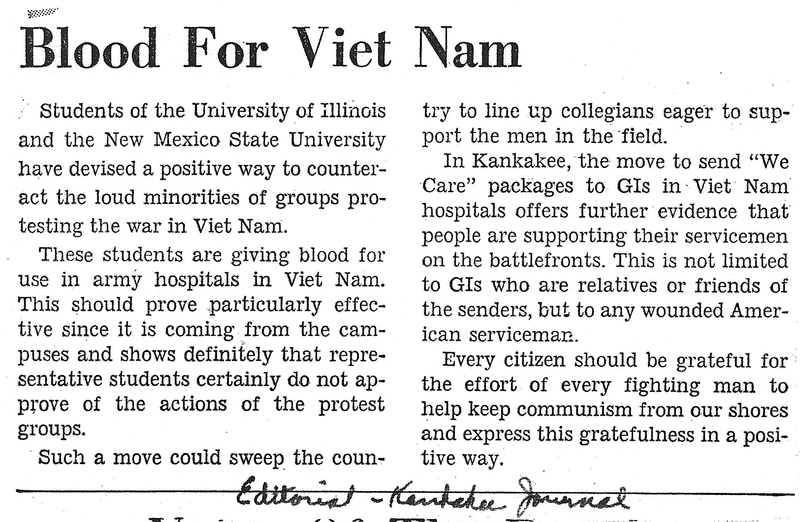 IDEA THAT SPRANG FROM THE BROTHER'S BULL SESSION FOR A BLOOD DRIVE TO SUPPORT THE TROOP IN VIET NAM SPREAD THOUGHOUT COLLEGE CAMPUSES THE MIDDLE WEST. 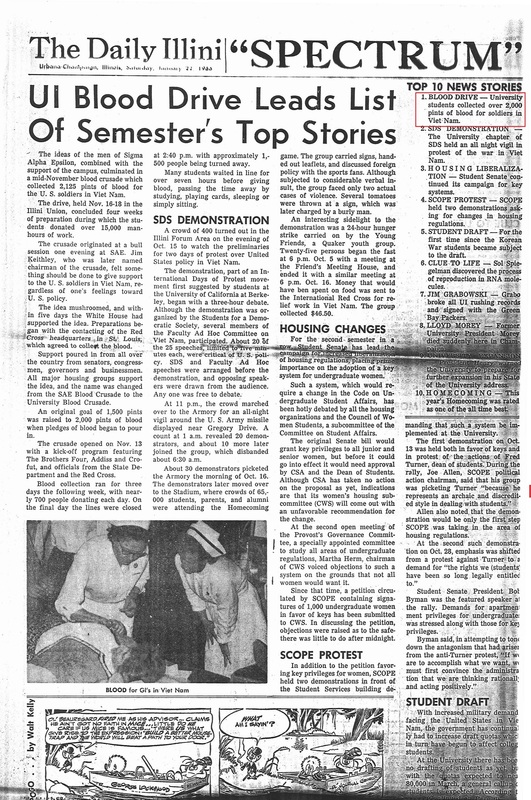 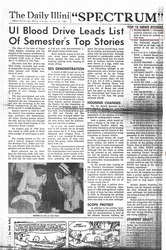 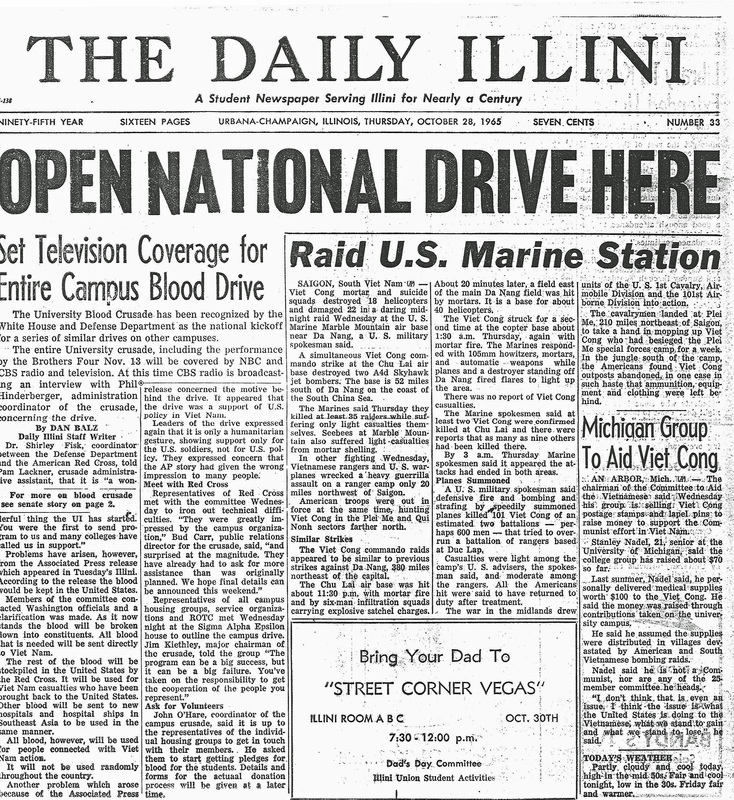 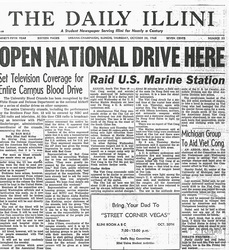 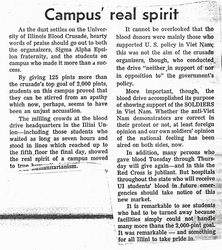 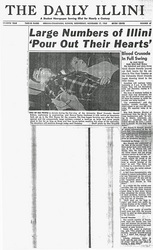 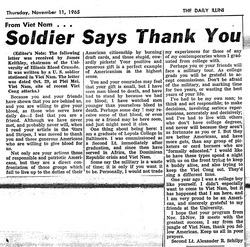 The Chicago Tribune on October 25, 1965 headline this in a front page story just above the fold story: Blood Drive for GIs in Vet Nam Opened at U. of I. in Urbana. 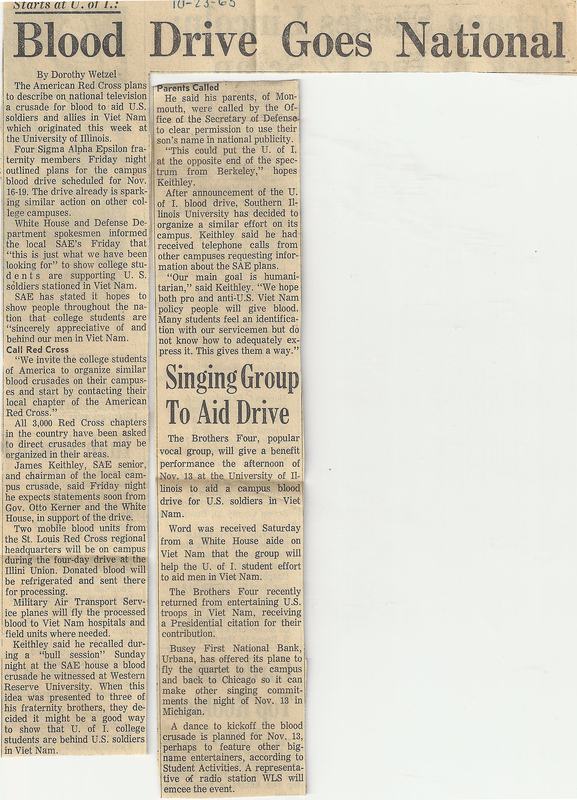 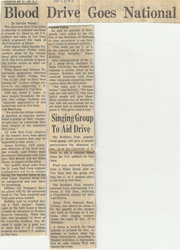 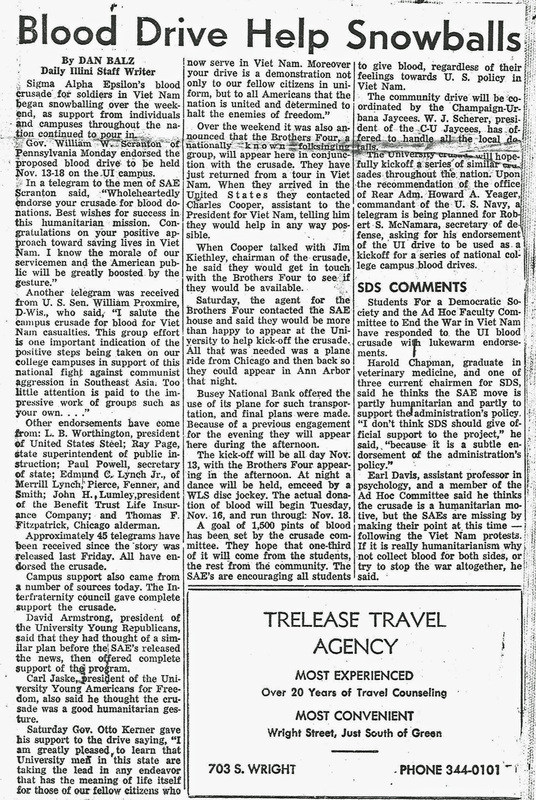 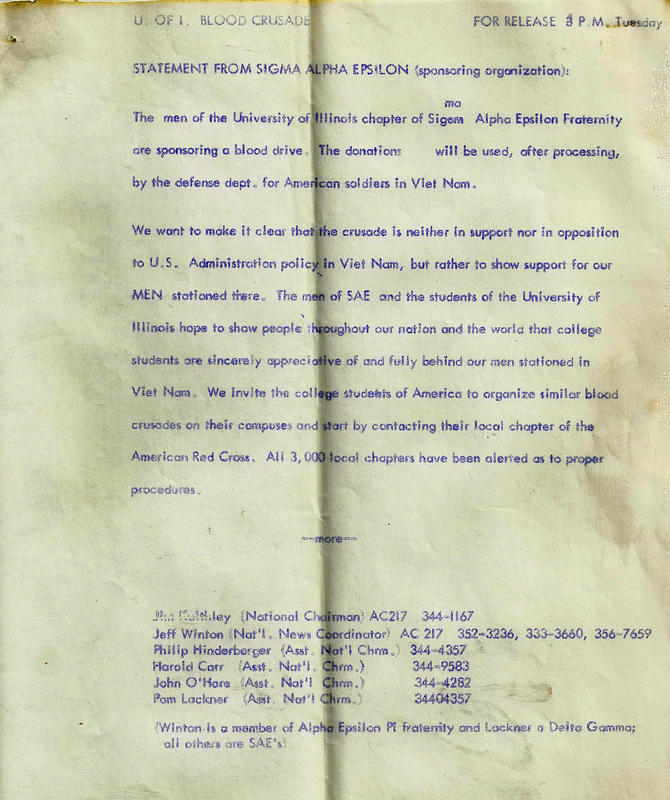 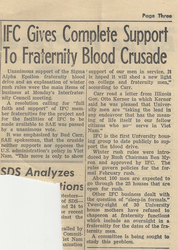 It reported how the Drive was organized by Sigma Alpha Epsilon, noted that Brother Jim Keithley was the Chairman of the Crusade and highlighted the success of the negotiation of the SAE brothers active in the campaign with the Champaign County Red Cross and the Defense Department. 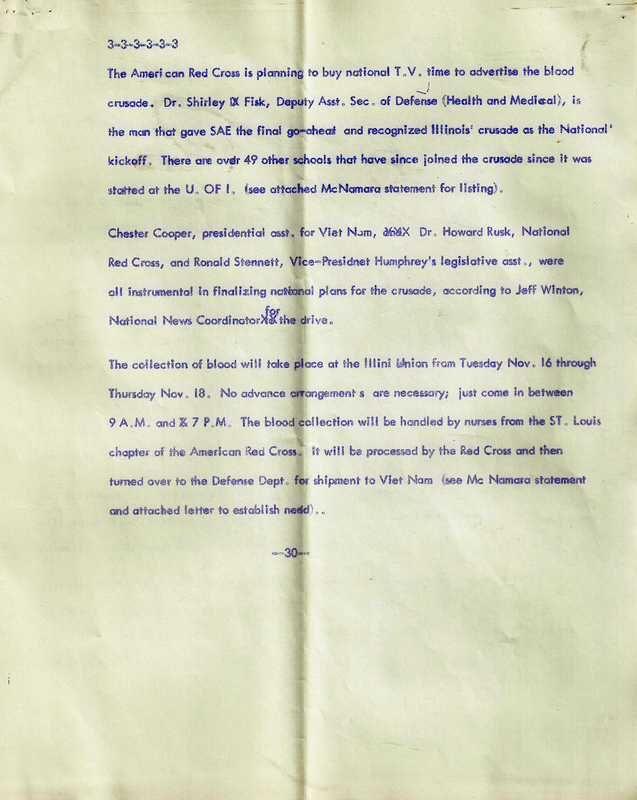 Active assistance of Illinois Senator Everett Dirksen for the campaign and participation of the Lyndon Johnson White House was also noted. 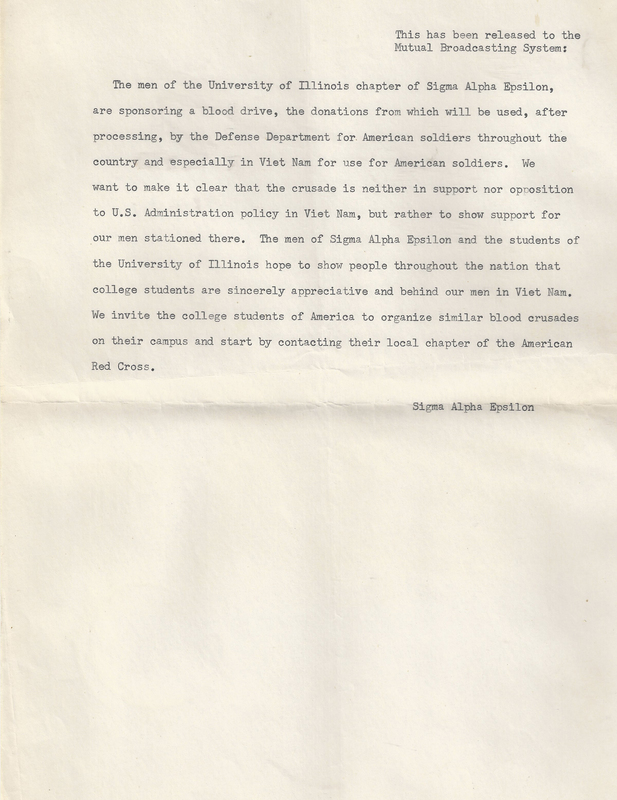 Other campuses like Southern Illinois University and Wichita State began troop supporting efforts. 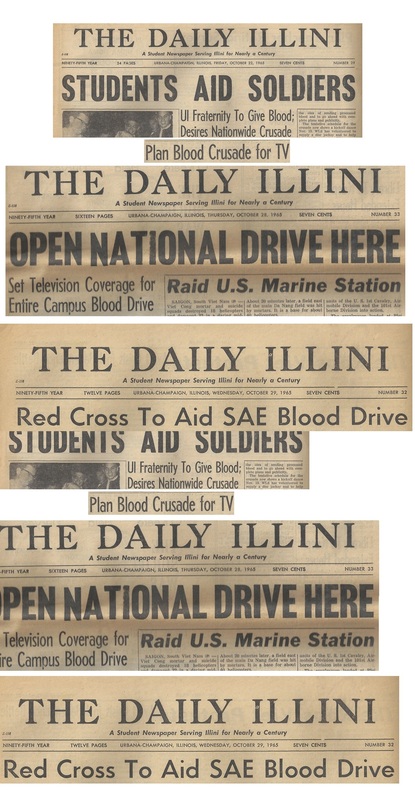 Press accolades and telegrams praising the SAE Blood Drive came in from around the country. 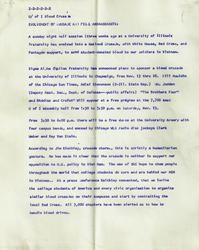 William Scranton, Governor of Pennsylvania congratulated the Brothers effort to boast morale; William Proxmire, U.S. 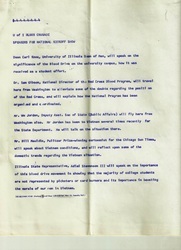 Senator from Wisconsin, saluted the effort as a positive step showing support for the GIs fighting in Asia. 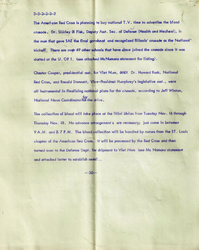 The president of U.S. Steel and other major corporate executives, Illinois State and City officials were also sent their congratulations. 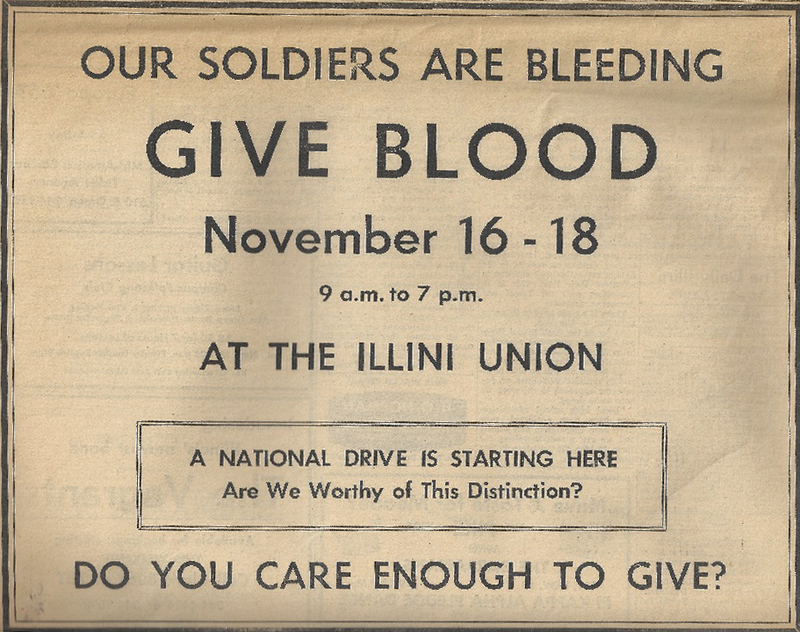 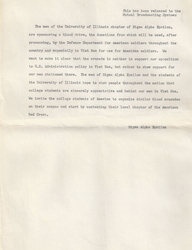 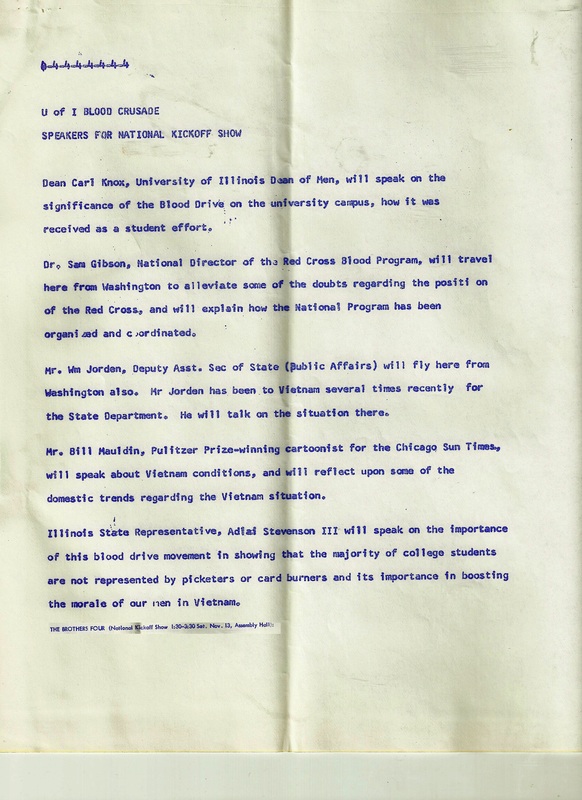 From November 13 to November 19th 1965 a SUCCESSFUL campus wide blood drive rolled out where 10,000 students at the University of Illinois got the required signed "pink slip" from their parents to allow them to give blood for the troops in Viet Nam. 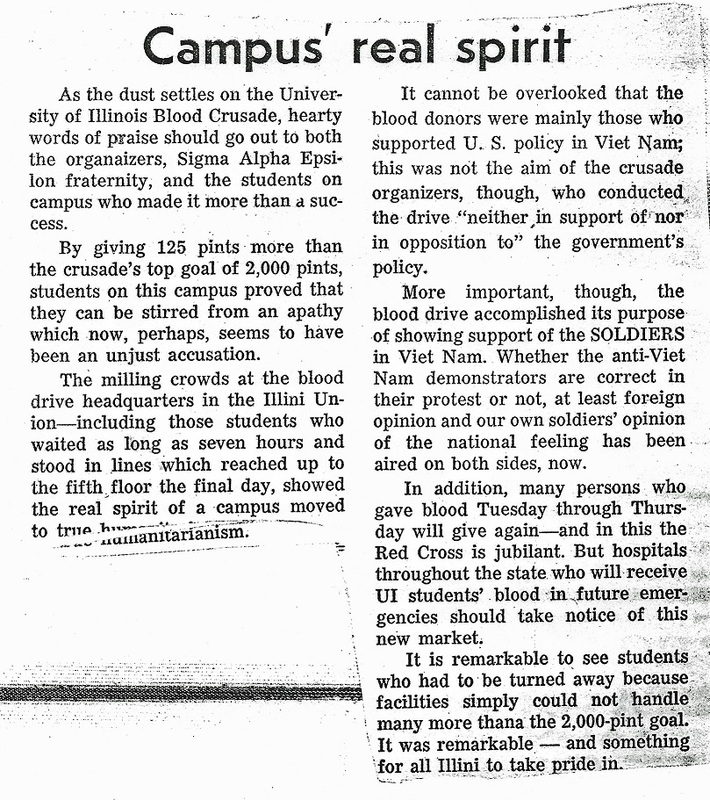 Over 2000 pints of blood were donated and flown to Viet Nam. 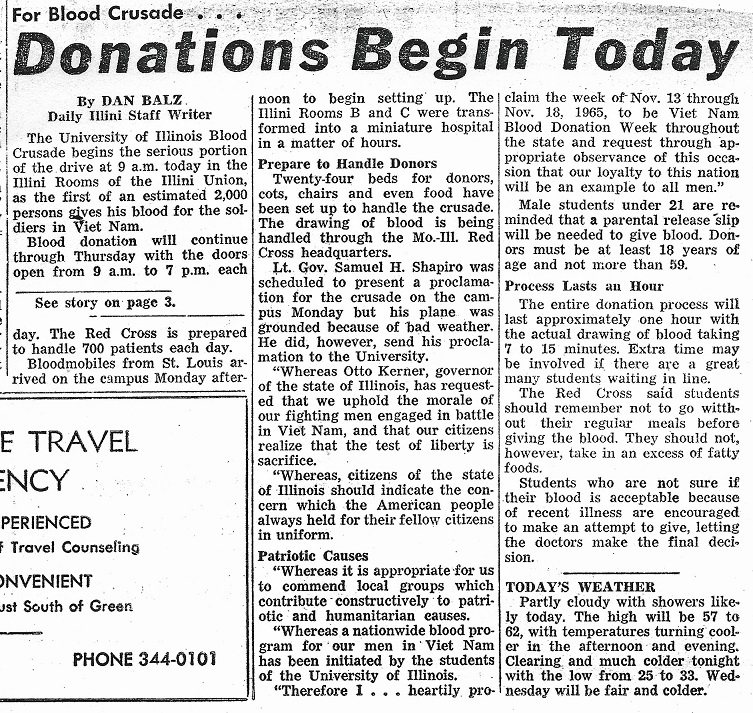 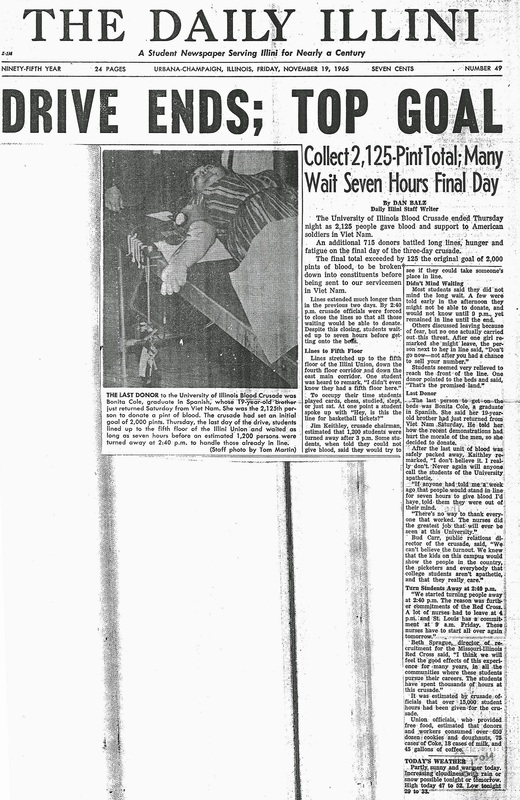 Donors had to be turned away each day because700 pints day was the maximum the Red Cross was equipped to draw. 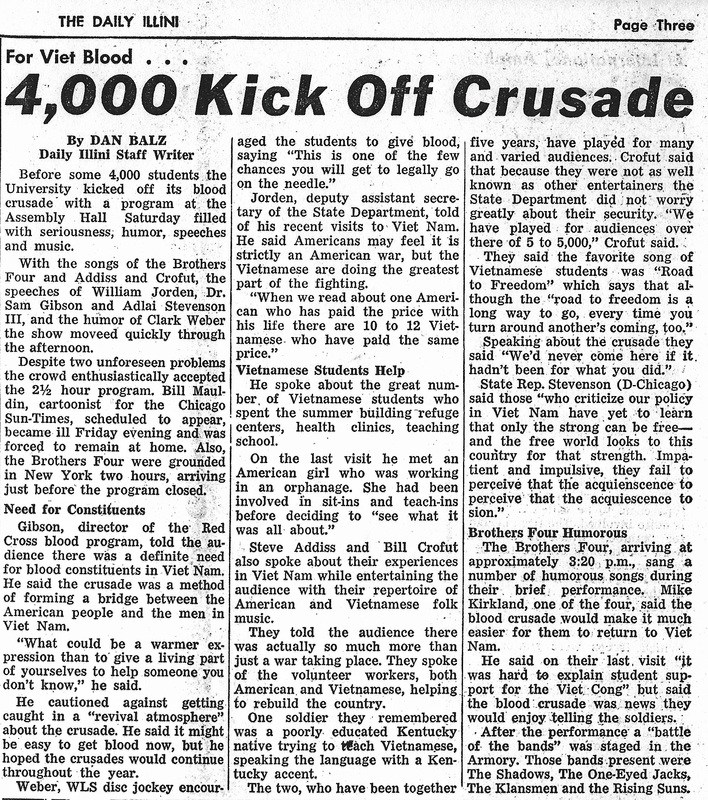 All told over 2000 pints were flown to Viet Nam. 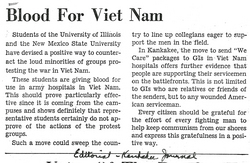 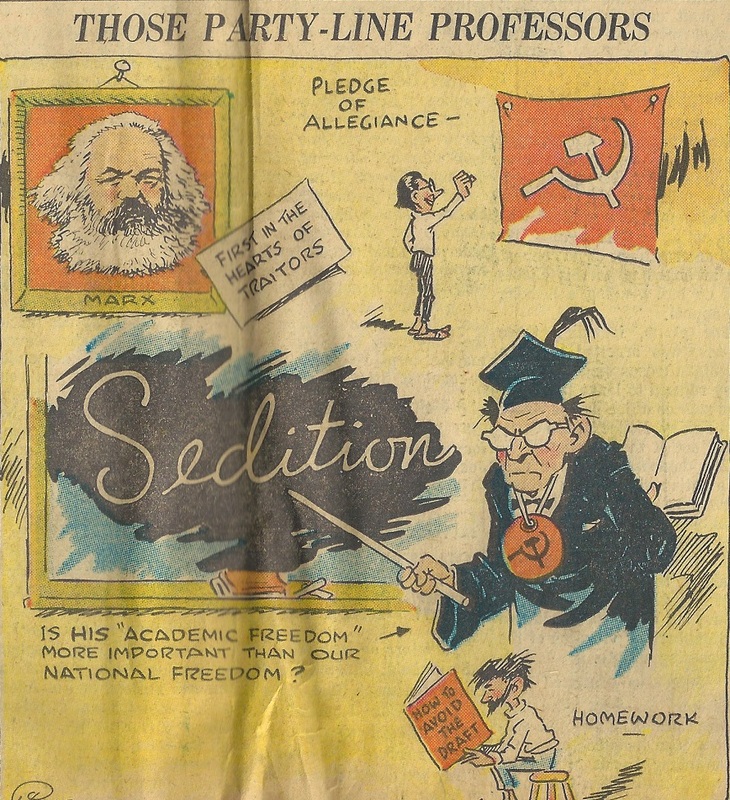 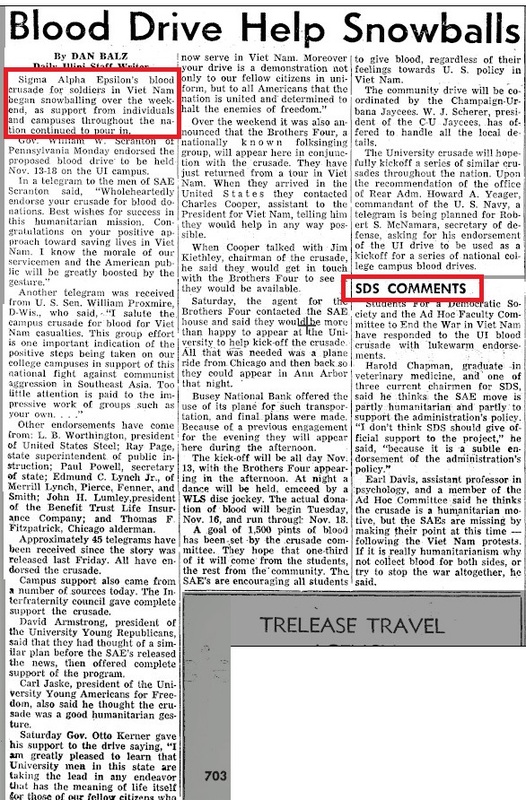 Note: If you read some of the articles below you will see the both the pro-Viet Nam attitude still prevalent in 1965 (see the Chicago Tribune front page Cartoon) and the beginning of the anti-Viet Nam movement as the publications covered groups opposing the drive. 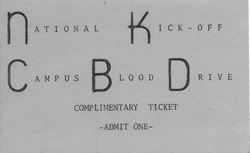 Jim Kethley '66 had the idea for the Blood Drive and was its Campus Chairman. 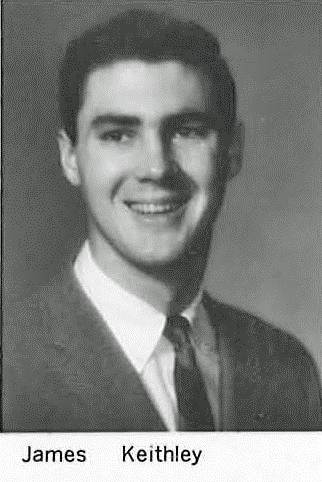 In 2012 Jim entered the Chapter Eternal. 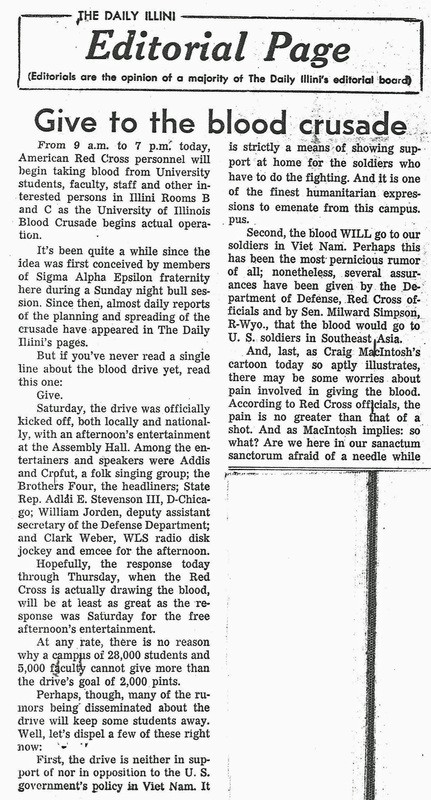 WHITE HOUSE and DEFENSE DEPARTMENT get behind the Blood Drive. 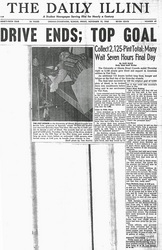 -- Big Name Recording Artits dive in. 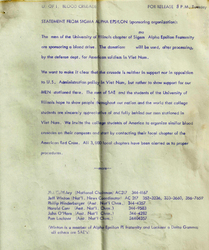 SAE press release to radio station. 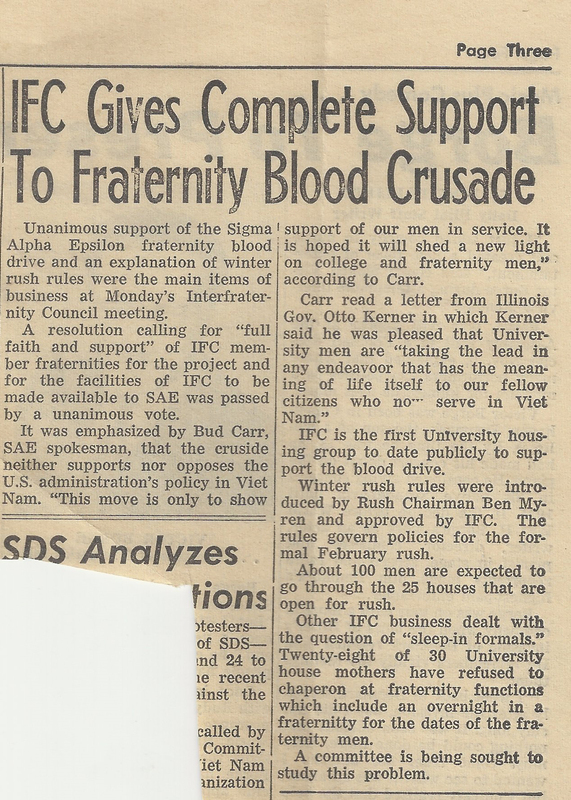 SAVVY PR like this lead by Brother Budd Carr got the word out about the SAE sponsored Blood Drive BIG TIME. 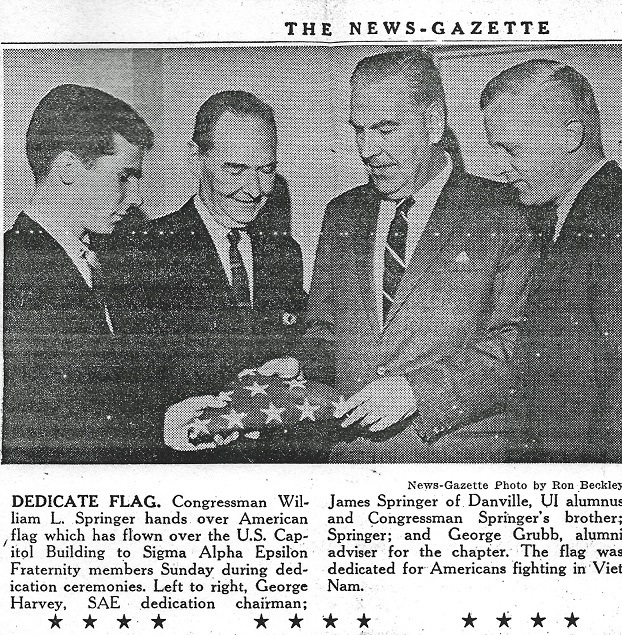 George Harvey '67 receives flag the flew over the Capitol for the Chapter from Congressman. 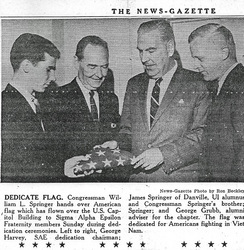 On the urging of Brother Harvey the chapter installed a flag pole in the front of the house to fly the Capitol flag. 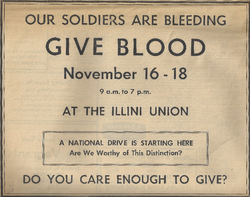 There are critics of the Blood Drive. 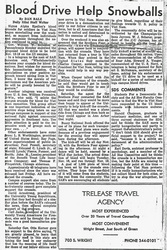 Critics are critisized. 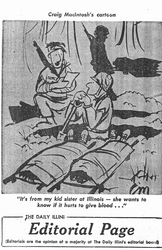 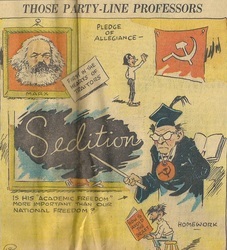 Chicago Tribune October 23, 1965 front page cartoon. 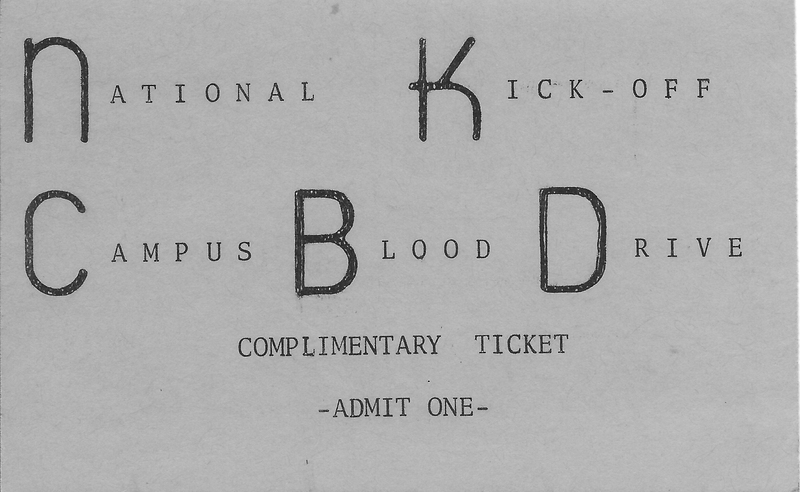 Ticket to see the Blood Drive the Assembly Hall. The 2 and 1/2 hour show included Brother Budd Carr's band the 'One-Eyed-Jacks'. 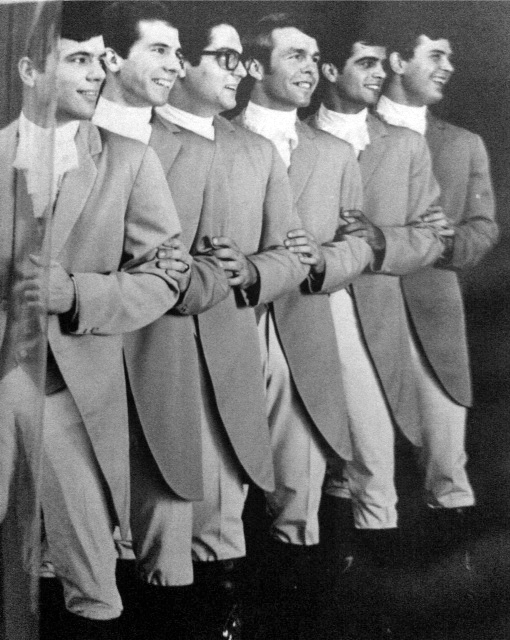 Budd Carr's the Band ONE EYED JACKS included: Budd Carr (vocals), George Harvey (guitar), Barry Fasman (keys), Bill Schneider (bass), Bob Amran (sax) and Bill Gedzun (drums). 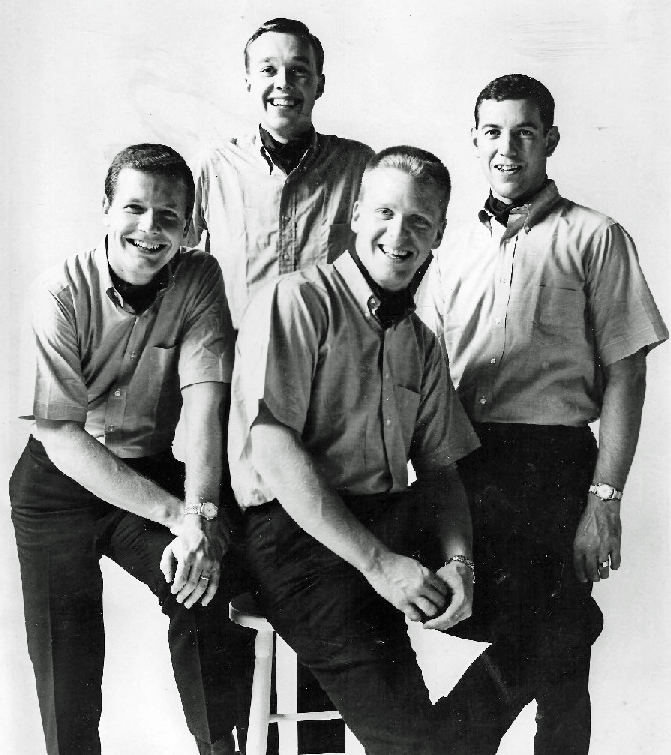 Brothers Four - Popular recording artists were a HUGE draw for the kick off concert. 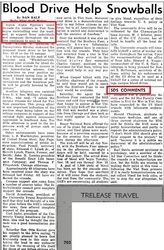 RESPONSE IS HUGE. 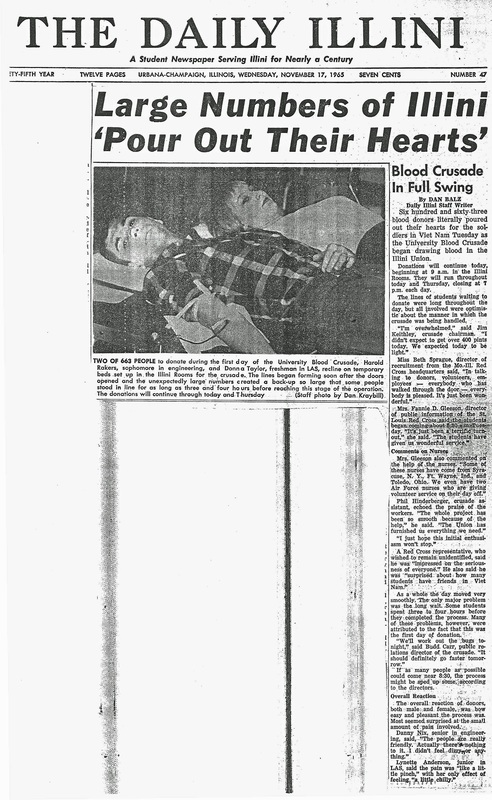 Brother John O'Hare Crusade Director quoted "IT'S UNBELIEVABLE". 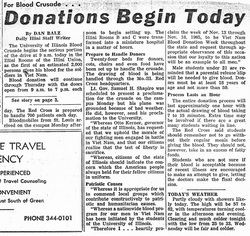 FIRST DAY DONATIONS GREATER THAN EXPECTED. 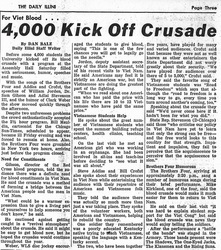 Crusade Chairman Jim Keithley expected 400 pints. 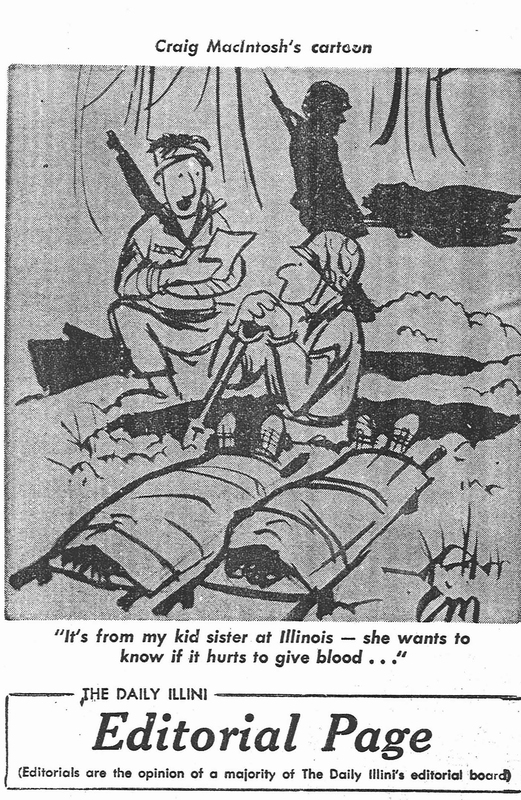 THEY GOT 600+. 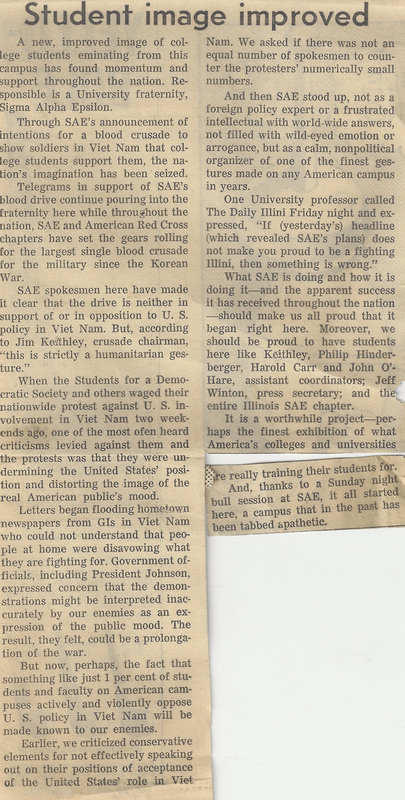 SAEs and U of I students praised in Daily Illini editorial. 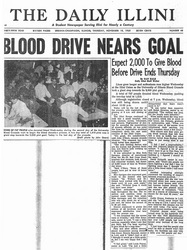 GOAL EXCEEDED Brothers Keithley and Carr both quoted as being esctatic over Blood Drive's results. 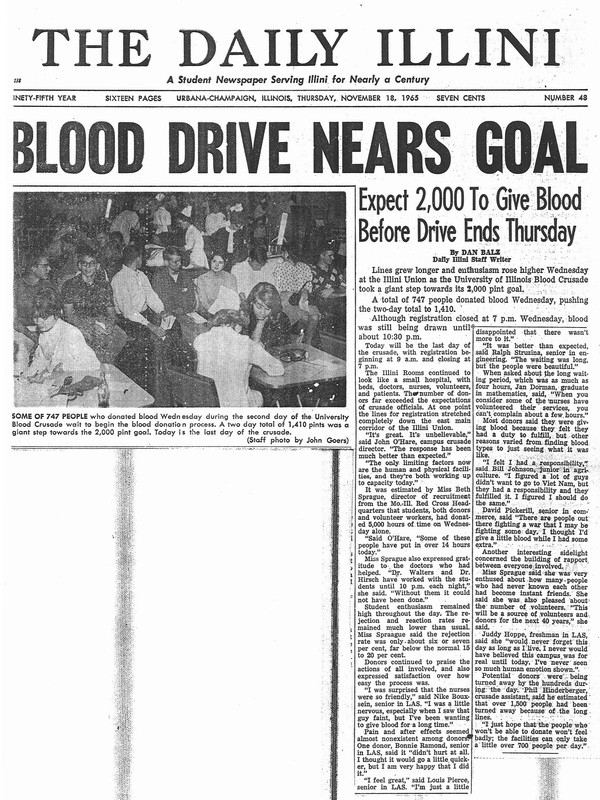 SAE's Blood drive NUMBER ONE STORY OF THE YEAR.